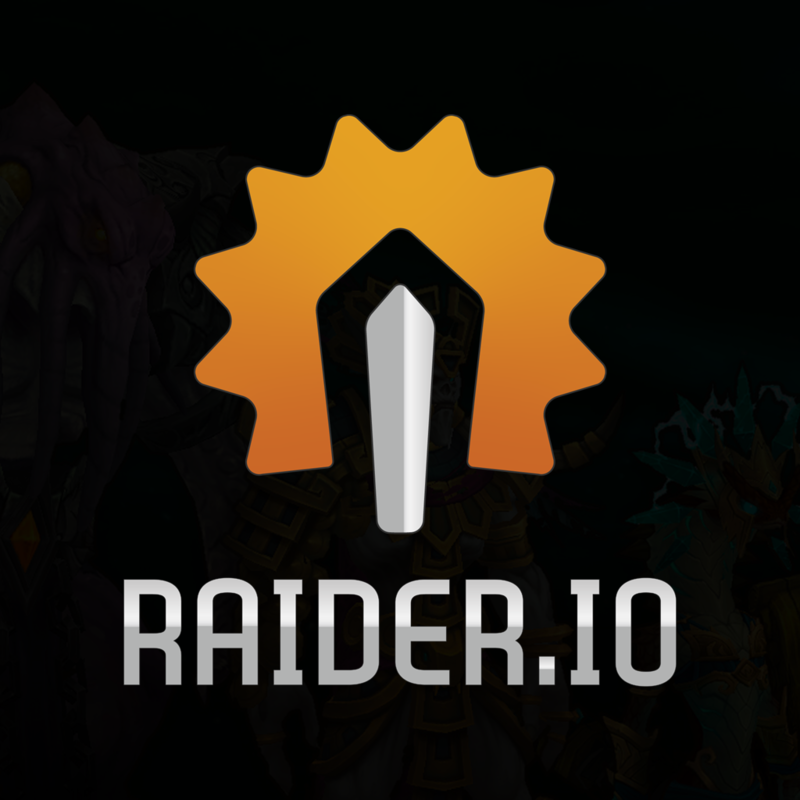 This is a companion addon to go along with the Raid and Mythic+ Rankings site, Raider.IO: https://raider.io. With this addon installed, you'll gain access to an easy way to view the Mythic Keystone scores and Raid Progress for players-- all without leaving the game! Simply hover over a player with your mouse, your guild roster, or even the Group Finder list where you see queued people; if they meet the minimum qualifications then you'll see their score and best run in the tooltip. Additionally, you can right-click players from the standard target unit frame to Copy Raider.IO URL and then easily look up their full profile on the site. With this functionality you can directly paste these URLs anywhere on Raider.IO to navigate to that player's profile page. If you have run into any problems, check out our FAQ at https://raider.io/faq, or join us on Discord at: https://discord.gg/raider #addon-discussions -- we always have people around willing to help. Have earned at least 200 points in the current or previous season. Honored and higher patrons do not have a minimum score requirement in order to be shown in the addon. Remember: We update the addon with the latest scores and top runs multiple times each day. Update regularly to ensure you are seeing the freshest information. Using the RaiderIO Client you can keep your addon updated automatically! 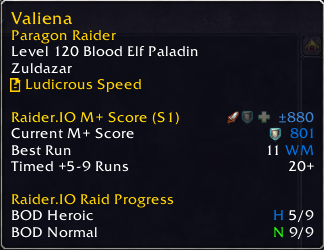 Raid information in tooltips simply lists the best progress seen for the player. Raider.IO M+ Score: This is the overall score for this character. If the score is from a previous season, then the value of the score is rounded to the nearest 10s, and is prefixed with ±. You can also identify the previous season score by looking for the (S#) suffix on the tooltip headline. Best Run: This will indicate the Mythic+ level for the player's best scoring run, along with the specific dungeon. Up to three plus signs + will be prefixed to the keystone level to indicate how much the keystone was upgraded during that run. Note: when this keyword is highlighted green it means that the player's Best For Dungeon is also the same as their overall Best Run. Best For Dungeon: You'll see this line when using LFD to form or join a Keystone group. 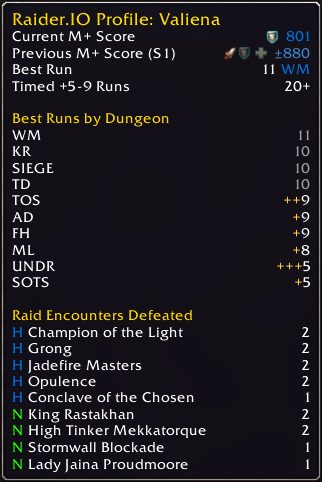 This will show the Mythic+ level of the player's best scoring run for the chosen dungeon. Timed #+ Runs: These lines indicate how many M+ runs have been completed by this player within the timer over the course of the current season. The player's two highest categories of Timed Runs will show by default. Main's Best M+ Score / Main's Current M+ Score: This indicates the best character score on this player's account, if they have registered on Raider.IO and linked their Battle.Net account. This will only show if the Main's Score is greater than the current character's score. If someone has a good score on their main, then much of their prior experience will help them perform better in dungeons while on their alt. Role icons included on Mythic+ tooltips can be thought of as badges earned by accumulating certain amounts of score while playing as that role. Fully opaque icons indicate they've earned at least 80% of their overall score in that role. Semi-transparent role icons indicate they have earned at least 40% of their overall score in that role. You can view your personal M+ and Raid Progress profile when you open the Dungeon Finder. This will be shown as a large tooltip alongside the Dungeon Finder frame with additional details about your per-dungeon performance. This can be used to help understand what dungeons you should try to focus on in order to raise your score. By default when you are in the Dungeon Finder it will show your own profile. However, you can press a modifier key (Shift/Alt/Ctrl/Cmd) to show the target character's full profile instead. There is also a config option to invert this behavior. The highest key completed for each member of your group for the dungeon you are in, or queued for. Avg. Timed +# Player Score: This is the rounded median score of players who have successfully completed Mythic+ runs in time at this level. This data is sampled from the past 60 days of runs tracked on Raider.IO, and it excludes the top and bottom 1% of scores at each level. This is intended to provide a guide for the type of score you might consider when forming or joining a group based on data seen across all players. You can pull up detailed information for all the characters in your group at once by utilizing the Raider.IO Group Search feature. Go to https://raider.io and hit Ctrl-V or Cmd-V to paste this while the site is in the foreground. This will then take you to the Raider.IO Advanced Search page for all the characters in your group. This will take you to that character's profile page. You can look up any character in the current database by using the /rio search command. When you type this, you will be presented with a small frame where you can enter the realm name and character name to search for. If they are found, then their information will be pulled up and displayed. You can type /rio search to hide the window. Our recommended settings are enabled by default, but we've provided several options to customize how and where the tooltips might show while in-game. Type /raiderio to open the Raider.IO options frame. Alternatively, you can also find a shortcut in the Interface &gt; AddOn settings frame. Here you can easily enable or disable various features, including whether to show scores from each faction, and various tooltip customization options. Remember to click "Save" to save the changes, or "Cancel" to abort and close the dialog. Scores map to a specific color based on their range. We've followed the standard WoW quality colors, but added additional gradients between the base values to provide more brackets to ascend through. These tiers are recalculated based on actual scores. Interested in supporting development of Raider.IO and getting some rewards while you're at it? We offer multiple levels of rewards. We love our fellow developers! We wanted to provide anyone in the community a simple way to tap into the scores that are a part of this addon. Addon developers can do this by utilizing the RaiderIO table to access certain APIs we provide. A collection of bit fields you can use to combine different types of data you wish to retrieve, or customize the tooltip drawn on the specific GameTooltip widget. A collection of functions you can call to dynamically build a combination of bit fields used in ProfileOutput that also respect the modifier key usage and config. A collection of different ID's that are the supported data providers. The profile function if multiple data types are queried will return a group back with dataType properties defined. A function that can be used to figure out if Raider.IO knows about a specific unit or player, or not. If true it means there is data that can be queried using the profile function. A function that returns a table with different data types, based on the type of query specified. Use the explanations above to build the query you need. Use this to draw on a specific GameTooltip widget the same way Raider.IO draws its own tooltips. ``` ShowTooltip(GameTooltip, outputFlag, ...) => true | false Use the same API as used in GetPlayerProfile, with the exception of the first two arguments: GameTooltip = the tooltip widget you wish to work with outputFlag = a number generated by one of the functions in TooltipProfileOutput, or a bit.bor you create using ProfileOutput as described above. Returns a table containing the RGB values for the specified score. Please refrain from using these API as they will be removed in future updates.